2006 MITUTOYO CRYSTA-PLUS M443 MANUAL FLOATING TYPE CMM, W/ RENISHAW MH20 PROBE, 15.74’’ X 15.74’’ X 11.81’’ (XYZ), 31.69’’ X 24.56’’ WORK AREA,S/N: 245760121. 2005 OGP SMARTSCOPE MODEL MVP 300, OPTICAL VIDEO PROBE, TOUCH PROBE, LARGE SELECTION OF TOOLS AND SUPPORT. BIG JOE 3000 LB ELECTRIC FORKLIFT. 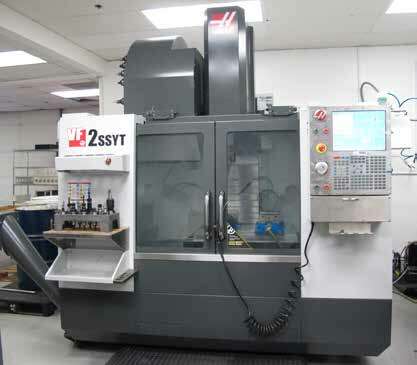 2010 HAAS TL-1 CNC LATHE, 2000 RPM, 16’’ X 29’’, WITH 2210 POWER ON HOURS 2012 HAAS VF2SS-YT CNC VMC, 12,000 RPM, 30’’X 20’’ X 20’’ (XYZ), CT-40, 40 ATC, 2012 HAAS DT-1 CNC DRILL & TAP CENTER, 15,000 RPM, BT-30, 20 ATC, HOURS CUTTING, S/N 1098530. (2012) 4) KURT VISES. LARGE SELECTION OF CT-40 AND BT-30 TOOL HOLDERS. METAL ASSEMBLY PARTS IN CRATES. INSPECTION TOOLS, HEIGHT GAGES, FASTENERS, POWER TOOLS AND HAND TOOLS, CABINETS, WORK BENCHES AND ETC. OPTICAL GAGING, S/N MVR 300 1055. (2005) AND 300 CUTTING HOURS, S/N 3085956. (2010 / 300 CUTTING HOURS) 4300 POWER ON HOURS, 950 CUTTING HOURS, S/N 1098475.